Providing you the best range of magnetic separator with effective & timely delivery. Magnetic separator is the high versatility machine, which is widely used in ore dressing, recycling, ceramic, chemical industry. The main function is remove iron from powdery material. 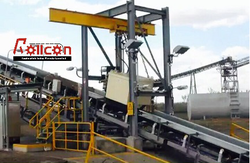 Magnetic separator is suitable for maaterial with particle size below 3mm, it can use wet seperation process for magnetite, pyrrhotite, calcination ore, ilmenite and other materials, but also can remove iron from coal, non-metallic minerals, building materials etc. Its magnetic system adopt high quality ferrite material or material compound with rare-earth magnet material, the magnetic strength of drum surface is 100-600mT. The Magnetic separator can be down-flow, semi-countercurrent, countercurrent type according to customer’s need. There are different magnetic strength for each type. The advantage of magnetic separator is simple structure,large process capacity, easy operation and maintenance and so on.